Ever since high school classes started in the Eddy house in 1910, the school trustees had looked for a new high school site. They talked to Danville area property owners about buying parts of their ranches, including El Rio land (4-acres between Alamo and Danville), the Chrisman property, Close land, the Peterson Ranch (8 acres), Mr. Kelley’s land (5 acres of today’s Danville Estates), Stelling property (5 acres) and the Flournoy ranch (4 acres east of downtown Danville next to the Creek). In the meantime the school population grew and land prices were rising. The Improvement Club was actively proclaiming through newspapers, by brochures, posters, speakers and advertisers the joys and benefits to be gained by buying land, building a home and living in the San Ramon Valley. Finally, in 1915, conversations with butcher Robert McAdue (McAdoo) led the trustees to offer him $5000 for his slaughter yard land north of Danville on the county road, amounting to 9 7/10 acres. They added an adjoining piece with a “club of oak trees” for $515. On Saturday morning, March 4, 1916, the board met informally at the Bank and paid Mr. McAdue for his land. According to historian Inez Butz, Jim Root and Noel Norris, both born and raised in the valley, said that Mr. McAdue was known as “Dirty Bob.” Evidently his hygiene practices were not the best. If you asked for Mr. McAdue no one would have known him by that name. Norris recalled seeing him on many occasions driving a wagon team over Crow Canyon Road to Oakland to deliver his meat. A mass meeting of citizens was held at the Fraternal Hall in March to talk about the prospective school. Trustee President William R. Meese presided and trustee Will Stewart spoke about the prospects for a new high school building, pointing out that, when there was no high school building, the university would not admit high school graduates without a special examination. In 1916 the three other trustees were August Humburg, William Williams and Josiah Boucher. Stewart said they envisioned a one-story building around a courtyard which could be increased by additions and extensions. The Courier stated: “Colonel William L. White embodied the opinion of all in a resolution conveying the sense of the gathering to favor a bond issue of $20,000 to run for 20 years.” The motion passed unanimously. In April of 1916, Mr. Norman Coulter of San Francisco was selected architect and things really began to move. A June bond issue election approved $15,000 for the school but flaws in the procedures nullified that result. Then voters in September re-approved the bond by 245 to 7. Keller and Crane of San Francisco were the low bidders to construct the five-room building and, in November, the Courier reported that construction was proceeding rapidly. 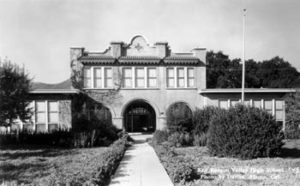 In February 24, 1917, the Contra Costa Gazette opined “The school is Mission style, built around a central court…The trustees plan to make it a model agricultural high school. It is located in the middle of a pear orchard.” The trustees proposed to provide two courses of study, one to satisfy the state university entrance requirements and another course of a practical nature. That year there were 48 students and 4 teachers. Meese presided at the San Ramon Valley Union High School dedication on March 14, 1917 where a large crowd filled the assembly hall, the courtyard and the grounds. Architect Coulter, principal Mrs. Elma Galvin and student body president Howard Wood spoke. Lincoln. S. Church then gave an oration. In late March students moved into the building, including several students from Lafayette, Saranap and Walnut Creek. Seven students graduated in May of 1917. The trustees had worked hard to reach this point, taking time from their lives as ranchers to create the curriculum, get supplies, hire teachers, find the land, hire and supervise the architect and builders and lay out sport fields. They were involved in all aspects of the school. In 1917 trustee Josiah Boucher was appointed a committee of one to stop the school boys from “frequenting the pool hall.” In 1918, when bills were presented, the minutes read “there was much discussion and criticism and the principal was urged to stop the wanton waste of penholders.” A telephone was finally installed in 1919 at a cost of $48. Baseball, basketball and football reports began to appear in the papers, although there were scarcely enough students to field teams. In 1920 Tassajara and Highland grammar school districts joined Alamo, Danville, Green Valley, San Ramon and Sycamore as part of the high school union district. Local newspapers and the school annuals reveal the life of the new high school, reporting on spring basket picnics at Ramona Park (part of Meese’s ranch), teacher and student quirks and sport contests. The family names of early class members are well known in valley history – Wood, Stelling, Lynch, Harris, Kelly, Van Gordon, Love, Wiedemann, Olsson and Peterson. The handsome, vine-covered school is fondly remembered by its graduates.